Silver & Gold IPL | Great Lakes Brewing Co.
T - Citrus, grapefruit, orange hops. A bit of a floral character. A bit bitter. The balance of the malts really good. The combination of styles is really done well. M - Medium body and light carbination. It finishes crisp. O - Its a lager and it has great hop flavor. Best part is 25 years of Great Lakes Brewing! Schizophrenic to its core, is it an IPA? is it a Lager? Maybe its both. And to kick off their 25th year of existence the fine brewers of Great Lakes isn't helping with the confusion- they are exacerbating it! Like any well made lager, the ale... er- lager pours with a bright straw color and racing carbonation. All that highlights its fluffy white foam cap that builds upon the beer. The only hint of unusualness happens with a modest haze that we'll find point to late addition hops. Bursts of citrus and grass spring to the nose. With no real caramel scent to ground the hops, the dry cracker-like barley offers up the thinnest of balances to pithy grapefruit, lemon peels, orange zest, leaf and stemmy notes. Similarly, the short-lived grainy-sweet upstart is soon overridden by sharp and acidic hop notes. White grapefruit, under-ripened oranges, lemons and tart juniper flavor tackle the middle palate and without the carmelly buffer that is normally provided by common IPA. Finishing bitter with the taste of fresh-cut grass, leaf and stem; the beer is a little rough around the edges even if its clean and crisp. Light in body, the hops make the mouth read the taste of IPA but the beer could be considered more medium if held to more of a lager standard. Early carbonation pulls the beer from the tongue in near champagne-like texture. Then fading quickly into a bone-dry closure of hop-derived astringency and herbal warmth- the beer sure does finish like Lager. If the beer is a hoppy lager, then it's a fine beer. If its a light bodied IPA, then it's a fine beer. There's nothing about the fusion found here that suggests that it is anything more or less that simply a fine beer. But it is one that makes me think with every sip. 12 oz. bottle, with best by date of 09/02/2013. Excited to try this newest offering from Great Lakes Brewing Co., a brewery that has quickly become one of my favorites. Poured into a Firestone Walker pint glass. A - Pours a light bright coppery orange colored body. Almost an IPA-like appearance. Some fine sediment floating around the glass. About two fingers of doughy off-white head on top. Thick, scattered lacing. S - Smell is a little different than anticipated: faint earthy hops, some bready malt presence, a bit fruity & floral and a bit of a spicy peppery smell are the most prominent scents here. Bit of soapiness and smells a bit like stale perfume, as strange as that sounds. T - Taste is of spicy bitter peppery hops, some earth, fresh squeezed peach / mango, clean toasted bready malts, and maybe a hint of rye on the finish. A bit more full-bodied than expected, and exceptionally well-balanced flavors. A bit of alcohol warmth on the finish, with some coppery / metallic aftertaste. M - Feel is of bitter hop resins, and some alcohol heat. The bottle describes it well: with a dry finish, yet leaves you feeling refreshed. An exceptionally smooth and drinkable beer. Overall, a highly palatable and interesting beer. Very unique and well-balanced flavors going on here; this is not at all what I was expecting. Bitter and sweet, dry and juicy, fruity and malty, with a modest 7.50% abv, this is definitely another job well-done from Great Lakes. 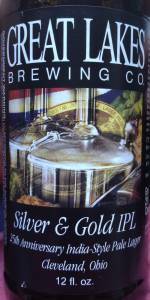 Great Lakes Silver & Gold IPL ---4/5. Smooth, bright, citrusy grapefruit. Nice full-bodied mouthfeel and crisp aftertaste without being syrupy. Very drinkable. One of the better beers I've had this year. A 6 of these could go down very enjoyably which is not something that you can say about all 7.5% beers. I've had this fresh on-tap and in bottles through various ages of maturity, and the beer was brighter and generally much more drinkable when young. In general, the close is too harsh with bitterness and light ethanol, meaning that they probably should have toned both down somewhat. Would I try this again? Probably, but only if I had little else "in the cellar," and could enjoy this quickly, when fresh. Pours a voluminous head of small, beige-colored bubbles, creating a very frothy-looking mass of foam. Retention is excellent, the foam lasting several minutes in a slow decline to a 0.3cm cap atop the body of the beer. Lacing is very good, with complex, moderately thick patterns clinging to the sides of the glass. Body is a medium-dark copper orange color, with light bringing out orange-yellow hues. Carbonation visible through the transparent body, medium in number and intensity. Aroma is of cut grass and weeds, a bit of woodsiness, mild citrus (lemon and grapefruit), and slight pine, with hints of malt (slightly bread-like) sweetness. Flavor is of a complex blend of pine-like and woodsy hops with notable accents of lemon and mild grapefruit, the malt largely in the background. Front of palate finds pine-like and woodsy hops with an edge of grapefruit rind and slightly bread-like malts. Mid-palate features medium intensity bitterness with woodsiness, cut grass and weeds, lemon and grapefruit rind with associated juices, and a quite subdued malt presence in the background that's slightly like toasted bread. Back of palate features medium-high bitterness with woodsy and cut grass-like hops, slight white pepper and ethanol, particularly as the beer warms. Aftertaste of moderate-high bitterness with traces of mild citrus, bitter herbs, and ethanol, which comes together as a bit harsh and unenjoyable. Beer is medium to medium-heavy in body, with medium carbonation intensity, resulting in a beer that has a mouthfeel that is gently foamy and smooth. Closes quite dry, with light stickiness on the lips and palate. Silver & Gold IPL pours a lighter copper or amber color. Looks crystal clear. It takes on a slightly orange look when held to light. There might be a slight reddish tint, as well. I like the color. It’s topped with a slightly off-white cap. It rises to about half a finger in height before falling back to a surface covering. It holds there for a while. Lacing was a little sticky, but on the lighter side. It definitely smells good. The malt base is very biscuity and bread-like. There is a hint of sweetness, but it’s very subtle. Hops smell piney and citric. Grapefruit and orange are the most notable scents. They blend really well with the base. I wasn’t sure how the hops and lager elements would gel, but they sure smell good. Better than expected. Alcohol is noted, but isn’t all that strong. Smells good. I’m impressed. At this point, it’s not a huge surprise. It tastes good, too! It definitely tastes like a lager out of the gate. The malt base is very biscuity. It does have just a touch of sweetness behind it, but it’s not much at all. The real magic here is the interplay between the hops and its lager qualities. They work well together! The hops have a nice citrus grapefruit and orange flavor together with just a little pine, as well. It is a bit bitter. I like it. Alcohol is there, but isn’t overwhelming by any means. Finishes biscuity, hoppy, a little bitter, and dry. Good stuff! The body is medium. Carbonation is very light and restrained. The bubbles are nice and soft. It goes down soft and easy. I could handle two or three in a sitting easily. Silver & Gold IPL is surprisingly good. It’s a really nice hoppy lager. It’s honestly much better than I anticipated. Great Lakes may surprise some with this 25th Anniversary release, but it doesn’t surprise me at all. Given that their flagship, Dortmunder Gold, is a lager…this is perfect. I believe Imperial Dortmunder was their 20th Anniversary release. Silver & Gold IPL is fitting for the 25th. Good stuff. Happy 25th!!! Silver & Gold IPL from Great Lakes Brewing Co.